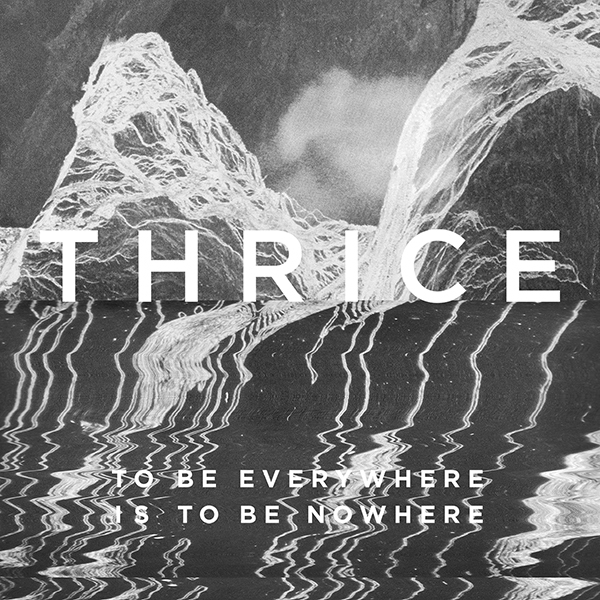 After a four-year hiatus, Thrice has started making waves again with their latest album, To Be Everywhere Is To Be Nowhere. For a band that has always sworn to be loyal to each other, they’re still humble enough to be amazed that their fans have stayed as loyal as they have. In support of their new album, the Southern California quartet is currently on tour with Circa Survive and Balance and Composure, and will be hitting Rebel Nightclub in Toronto tonight. In the midst of this tour, having just finished a tour earlier this year with Rise Against and The Deftones, and with the release of their first album since 2011’s Major/Minor, the past couple years have been a pretty heavy comeback for the band. Their hiatus was originally called due to members wanting to spend more time with families, and while their families are still a priority, they are committed to making the band work. “Even though we’ve been busy, I think we’re managing the amount of touring that we’re doing and trying to space [the shows] out with a reasonable amount of time in between tours,” drummer Riley Breckenridge explained in our recent interview. He added that it’s been much more manageable this time around. It’s a big difference to have just come off of a four-day Thanksgiving break, compared to when they used to tour and they’d “do like 8 weeks of touring and then be home for three or four days” and then go out again for six to eight weeks. Their new approach is keeping their spirits high, everyone is feeling fresh and excited about being on the road again, doing what they love, but still being able to spend quality family time. Approaching 20 years since their first album, Identity Crisis, it’s no surprise to any parent that there was a break needed. With a job that pulls you away from your family as much as being a musician does, trying to juggle both can be really hard on your mental state. “It’s super tough. Dustin and Teppei’s kids are a little older now, but I’ve got a two-year-old son and a six-month-old daughter. I saw Dustin and Teppei go through what I’m going through now like five years ago and I didn’t understand how difficult it is. It’s really tough being away from your kids and especially with my son being two now, I think he realizes that daddy is going away for a while.” While it’s hard to be away, Breckenridge also loves his job as a musician and said that it’s a give and take when you’re away from home for six to eight months a year, but also given the opportunity to be 100 per cent at home when you are. What’s extra cool about that is that your kids will get to grow up and listen to, watch videos of, and hear about all of the things their parent was doing in the time that they were away because it’s going down in music history. Teppei’s kids are even starting to learn some of the band’s songs on guitar and piano. With how far the industry has come technology wise since Thrice came up, it really affords musicians the opportunity to do both and still have a realistic balance between the two. “We’re doing a lot more virtually – using productivity apps and file sharing and stuff like that. Recording software has come such a long way. It’s really easy to build [the] rough framework of a song, make a demo, and then get songs to a point where they’re feeling good without having to grind away in a rehearsal space for eight or 10 hours a day, five days a week,” Breckenridge said, adding that it’s pretty easy to get creatively burnt out like that, but they do still like to hammer stuff out together sometimes. Some of the processes are going to differ of course, after that long of a break from making music together, but getting back into the studio wasn’t tough for them. “I was a little worried that maybe some of the creative juices or the chemistry would’ve fizzled out during the break, but it went a lot quicker and easier than I would’ve even expected.” Being the self-proclaimed worrier of the band, Breckenridge was concerned about much more than that during their time apart. Them not keeping in very close contact during the hiatus probably didn’t help with that. Getting right back into the swing of things so effortlessly is a cathartic experience, particularly when it’s received as well as their return has been. The fans have received the new album with an outpour of support and excitement and the songs have translated outstandingly in a live setting. “It’s pretty amazing to me, with how short people’s attention spans are and how much music is available to people instantly… three to four years is a long time to go away and I didn’t know how many people were still going to be interested when we came back. So for people to be as enthusiastic and supportive as they have been has been really incredible and is something that we’re incredibly thankful for,” Breckenridge said, reflecting on the past year since the album dropped. Reflecting further, he said the album that resonated with him the most before this one, was the making of Vheissu, because it was a huge turning point for them as a band, creatively. Making a record so different from their top-selling album was risky for them. It pushed the major-label’s boundaries, and if they hadn’t done that, there was fear there that they’d have “flamed out” by now. With a back catalogue as substantial as theirs, it’d be easy to regurgitate old material, or even simply come back with some re-releases and succeed off of their already produced material, but that’s not what they’re about. “Being able to deliver on that promptness is awesome and that we’re not just a nostalgia act is also very cool, because there are a lot of bands that took breaks that come back for that tour or that re-release of an old record and just play greatest hits sets and that’s not why we do this. We want to keep making music together and keep pushing ourselves creatively.” That was displayed clearly on this album, being their most politically-charged work to date. Political influences had been exhibited in their lyrics previously, most apparently in Broken Lungs, which Breckenridge confirmed was reflective of the 9/11 events – the lyrics reading, “cause we all watched the buildings fall, watched the scales fall from our eyes,” – but this was a much more lyrically vulnerable and politically influenced effort. The evident drive and determination behind their return makes it clear that Thrice is back for good. Initiated by a text from vocalist Dustin Kensrue, the band reuniting can be credited to a particularly influential Brand New show. “It was pretty unexpected and awesome to get that text, and for him to be so enthusiastic about getting back into it.” Breckenridge said, as he explained how relieved he was that his tiny glimmers of hope towards the band getting back together were finally coming to fruition.